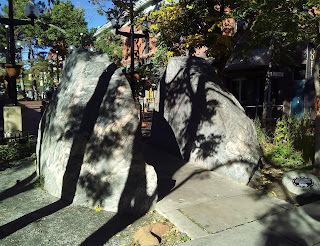 Last week I spent a few days in Boulder, Colorado. I was there on non-beer related business, but these days you can't go to Colorado and not drink beer – even if it isn't exactly the capital of American craft beer, it is certainly a heartland for it. 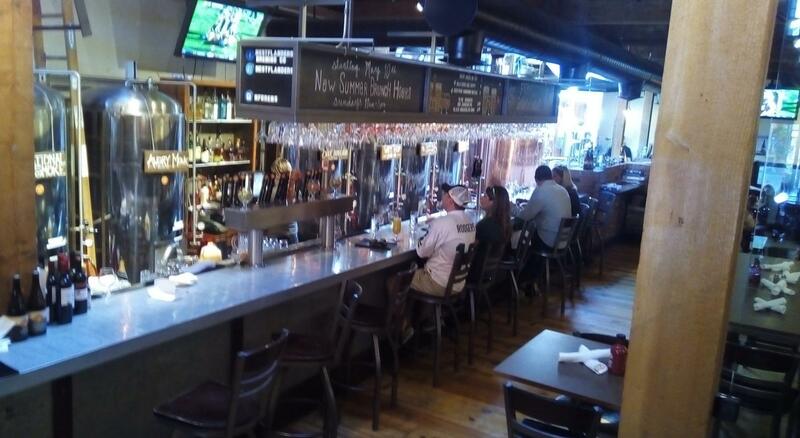 And Boulder, just a few miles outside Denver, is in turn one of the top places for beer within Colorado – along with Fort Collins up to the north, home to New Belgium Brewing and one of the main Anheuser-Busch breweries, and of course Denver itself. In addition, while Denver is home to the Great American Beer Festival, Boulder is home to the US Brewers Association, which organises GABF – and is also the source for that much argued-over US definition of Craft Beer. So on my trip to Boulder, there was plenty to explore – even after I decided to focus my spare time specifically on brewpubs and brewery taps. I started with Sunday brunch at West Flanders Brewing Company, a brewpub which as its name implies does quite a few Belgian-inspired beers. It's conveniently located on Pearl Street, Boulder's old high street which is now mostly a pedestrianised boutique shopping mall. The pub followed a pattern that became familiar – far deeeper that it is wide, stretching far back from seats on the pavement past serving tanks of beer, the brewery itself and the kitchen. I was slightly surprised to find myself the only one ordering beer at 10am – it was Sunday, after all! – but was pretty pleased with my breakfast omelette and my tasting flight, which included an excellent Saison, a tasty Wet Hop Pale Ale, a decent Belgian dark ale and an OK abbey Tripel. Plus it's a cool, modern place with lovely staff and a relaxed vibe. 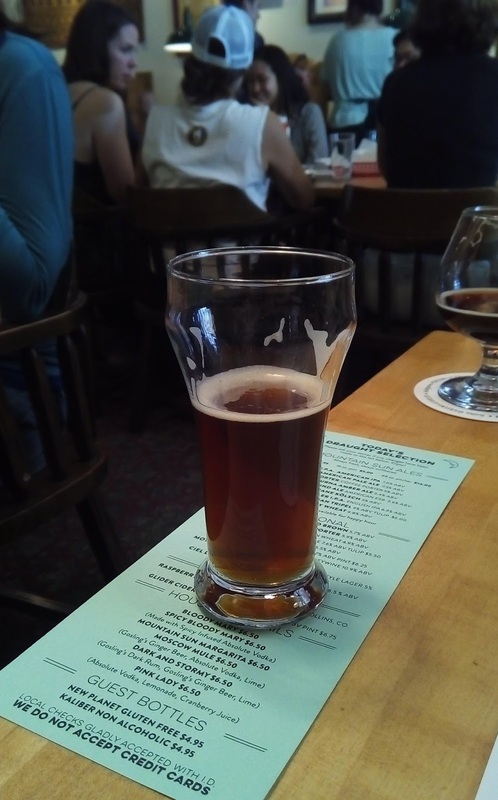 Next, it was off to the other end of Pearl to Mountain Sun where I was meeting a friend via Untappd who'd come up from Denver for the afternoon. Mountain Sun is part of a small group of brewpubs and has a hippyish ambience, with tables packed close enough to be cosy without being crowded. The mixed crowd produced a buzz of conversation. Again, I chose a tasting flight, this time of six beers. Most of these brewpubs will pour you several small measures – typically four to six quarter-pints, so 4oz or 5oz each – of your chosen beers, and charge you not much more than the cost of a pint or a pint and a half. Particularly good here were the Colorado Kind Ale (an excellent interpretation of Fuller's ESB) and the Java Porter. Our next destination was Twisted Pine Brewing, a little bit out of town. It's probably about 20 minutes walk, but we – like many of the other visitors we found there – drove instead. I'd had a few of its beers on a previous visit to Colorado and was curious to try more, so it was great to see the list of over a dozen regulars and specials on the brewery tap's blackboard. The brewery tap is mostly natural pine, unsurprisingly enough. It was about half full and there was American football on TV – this is a Sunday afternoon thing in bars, apparently – with a couple of groups cheering fairly raucously. We did find a couple of duds – a strange watery alleged Grätzer that tasted more like smoky Lemon Barley Water, and a spice-laden murky grey-brown soup of a pumpkin pie spice beer. Guys, I know America is the land of excess, and that this is even more true in craft beer, but trust me: when it comes to spice in beer, less is more! On the plus side, Eleven Birds – a chewy and hoppy beer in the Belgian brown ale mould – was excellent, as were a Saison called 20 To Life (celebrating the brewery's 20th anniversary) and a powerful 8% Bretted and barrel-aged IPA called Funk In The Trunk. From here we headed back into town and Walnut Brewery, a spacious and airy brewpub which is part of the same organisation as the extensive Rolling Rock chain. More like a converted warehouse inside, there's huge brand images of its house beers on the walls, and the brewery is visible above and behind the bar on a sort of mezzanine level. All the usual American craft beer styles were on offer and well made – Pale Ale, IPA, brown ale, stout, Irish Red, etc. The IPA, Red and Pale Ales were notably good. The one exception to an otherwise predictable range was a Black Lager that turned out to be a decent interpretation of a Schwarzbier. My friend had to head home at this point for family dinner. It was still only mid-evening, so after bidding him a safe trip I decided to walk back to West Flanders to try some more from its extensive range. This time I picked from the higher end of the strength and flavour spectrum, where the IPAs live. The star was actually the one non-IPA – Recreational Smoke Porter, rich, dry and complex, though with no dope but lots of woodsmoke. The others were heavily hop-forward, without enough of anything else to carry it really well. The Black IPA and the Imperial IPA were pretty good regardless, but in the 'regular' Third Kingdom IPA it was just too aggressive. And so to bed, with jetlag still lurking and a case of the munchies! Part 2: Public omnibuses, in the land of the car? Yes – and A-very fine beer too!